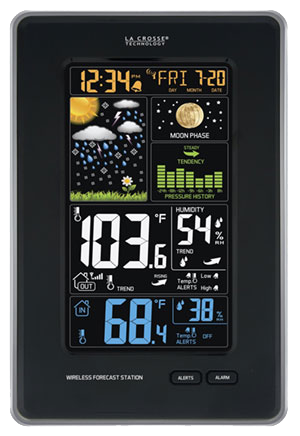 Wireless Color Weather Station provides precise, real-time weather data straight from your backyard. 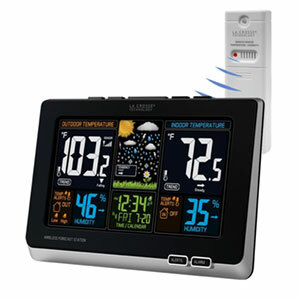 New — Monitor forecast and temperature trends and set high/low temperature alerts. Animated color forecasts react to changing barometric pressure. 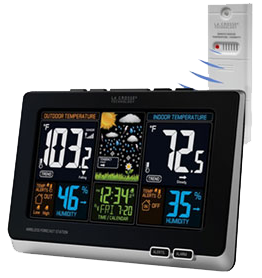 Monitor in/out temperature and humidity with daily min/max records — all on one easy–to–read color display with adjustable brightness. Receiver: 6.16" L x 0.93" W x 9.65" H TX141TH-Bv2 Sensor: 1.57" L x 0.79" W x 5.12"